aside from providing and integrating web design & internet marketing services, cybersphere can also fulfill your traditional marketing requirements - designing business cards, letterheads, brochures, print advertisements and multimedia (CDs, DVDs, Interactive Business Cards) that compliment your website, drive sales and present a consistent corporate image. we have a wealth of experience producing innovative marketing material to catch your customers' eyes and win their hearts & minds... we have a great contact base within the publishing world to draw on, can get great savings on online and local/regional/national print advertising - we can even get you great deals on print runs too! promoting your company, its products and services across the online / offline divide can significantly improve brand awareness, customer loyalty, response rates and conversions to sales... Additionally, campaigning across media that you have not previously tried could well provide exposure to a new calibre of client - as experienced by several clients who purchased a list and emailed 'DVD request forms' before posting them out to respondents - reducing waste, identifying serious prospects and increasing RoI in the process. Many BlueChip and Fortune 500 companies integrated their online / offline promotion years ago and recent research proves that mixing email marketing and direct mail campaigns can create a bigger impact, yield much higher response rates and considerably increase Return on Investment (RoI) if planned & executed correctly. we weigh up the numerous factors that contribute to make your campaign unique before proposing and delivering a solid, results-oriented campaign across specific media... we look forward to your call! Poor Existing Website..? New Product Launch..? Change of Corporate Identity..? Taking an idea to market? Launching a new website? 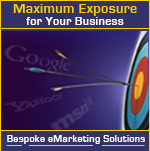 Looking for a highly targeted website & an out-of-the-box marketing campaign? We can help you find blue sky!